TÜV-tested and patented COOL*SAFE® security when transporting medicine, plus lots of space for other things. Medicine is optimally protected from the risk of becoming frozen caused by ice packs and stays cool for hours up to + 8° C. The cooling bag that provides the cooling for medicine that must be cold(-chain) protected is located in the bottom part, while the top part is a traditional day backpack. 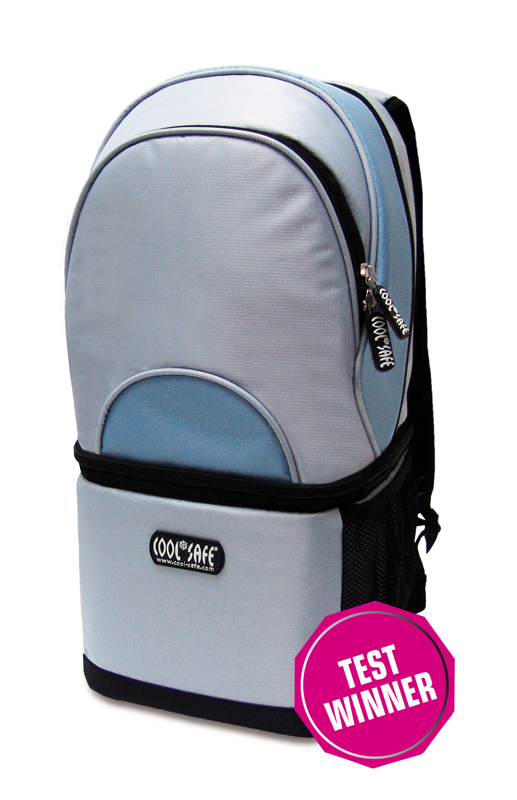 The COOL*SAFE® medicine cooling backpack is delivered with 6 gel packs. Carrying comfort during sports (e. g. hiking) or cycling! Two separate main compartments with high-quality zips and easy-grip zippers at the top part of the backpack. * These measurement results are from the TÜV Rheinland and have been measured with one kind of drug. Of course the TÜV cannot test the cool bags with all existing medicines, therefore differences in the cooling duration can occur with other drugs.